Gallia Academy defenders Cade Roberts and Trentin Waller (17) combine to bring down Ironton quarterback Gage Salyers during a first half run Friday night in a Week 9 OVC football contest at Memorial Field in Gallipolis, Ohio. GALLIPOLIS, Ohio — Ronald Reagan was running for re-election, the Summer Olympics had just ended in Los Angeles, and current Gallia Academy football coach Alex Penrod was likely at home in diapers sitting in his play pen as a one-year-old toddler. 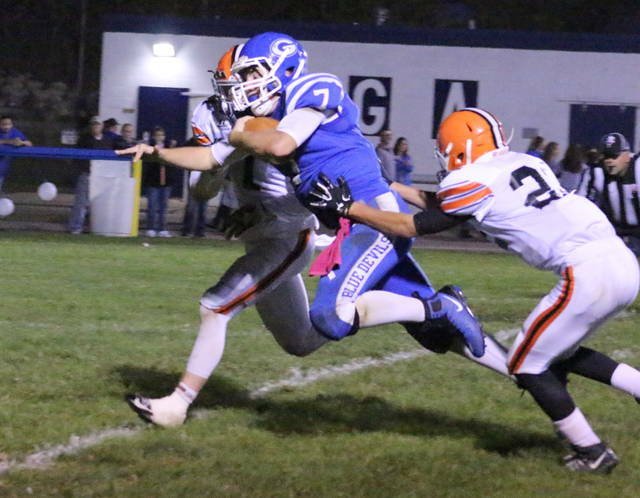 Needless to say, it had been a long time since the Blue Devils last defeated Ironton at home. The Gallia Academy football team celebrated Senior Night in grand fashion after picking up its first win over the visiting Fighting Tigers since 1984 Friday night following a 38-20 triumph in a Week 9 Ohio Valley Conference contest at Memorial Field in the Old French City. The Blue Devils (4-5, 3-3 OVC) gave the Fighting Tigers (4-5, 3-3) a taste of their own traditional medicine as the hosts produced a punishing ground game that resulted in a 385-166 advantage in rushing yards. In fact, the Blue and White had more yards on the ground than IHS could muster in total offense —with Gallia Academy claiming a sizable 425-287 edge in total yards. The potent 1-2 punch of Boo Pullins and Justin McClelland accounted for 314 rushing yards and all five scores, while the defense limited the Orange and Black to just six points after the break — allowing Gallia Academy to snap a seven-game losing skid Ironton in the process. After earning the program’s first victory over the Fighting Tigers since a 14-7 road decision back in 2006, Penrod was more than a little thrilled in how well Senior Night festivities ended up going for his troops — particularly seniors Garrett Burns, John Stout, Tanner Allen, Matt Moreaux, Nathan Mitchell and Jonas McCreedy. Early on, it was a dog fight between stingy defenses as both teams traded possessions throughout a scoreless first quarter. With GAHS facing a fourth-and-two at its own 26, the Tigers caught a break as the ensuing snap sailed over the head of punter Boo Pullins. Pullins tracked the ball down in the end zone and tried to boot it out of there in a crowd, but missed the ball shortly before being hit. The loose ball trickled around in the end zone before Hunter Humphreys fell on top of it, giving Ironton a 7-0 advantage with 11:14 left in the second canto. Both teams traded punts, then Gallia Academy strung together a 7-play, 70-yard drive that resulted in points after McClelland capped things with an 18-yard diving scramble. McClelland tacked on a 2-point run that gave the hosts an 8-7 cushion with 4:29 left in the half. Ironton answered with a 7-play, 69-yard drive that ended with a 26-yard scoring pass from Gage Salyers to Alex Cox for a 14-8 lead with 1:59 remaining. The Blue and White retaliated with a 10-play, 63-yard drive that ended with a 1-yard run by Pullins. Caleb Henry hauled in a successful 2-point pass from McClelland that gave the hosts a permanent lead of 16-14 with 11.6 seconds left until halftime. After a Gallia Academy punt to start the second half, Ironton came up short on its ensuing possession after missing a 28-yard field goal attempt wide-left. Both teams then traded turnovers, which gave GAHS the ball at the Ironton 28. The Blue Devils needed just two plays to cover that distance as McClelland scored on a 4-yard scamper, then McClelland found James Armstrong on a 2-point pass for a 24-14 cushion with 4:56 left in the third. The hosts put together a 6-play, 87-yard scoring drive on their first possession of the fourth as Pullins plunged in from two yards out, making it a 30-14 contest with 9:43 remaining. 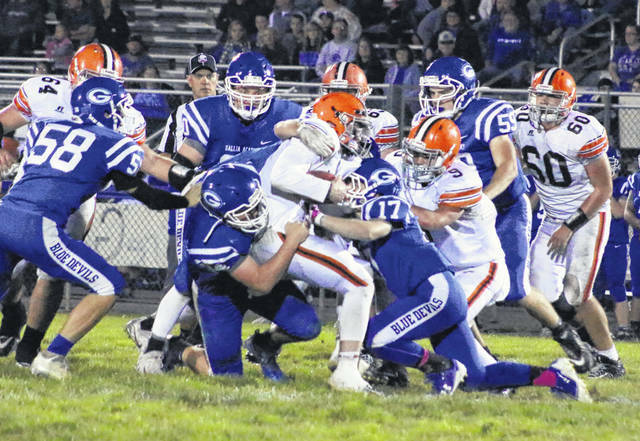 Ironton fumbled the ball away on its very first play of the ensuing drive, then GAHS covered 14 yards in two plays while taking its largest lead of the night. Pullins tacked on his third rushing score with a 5-yard run at the 8:46 mark, and McClelland found Armstrong on a 2-point conversion pass for a whopping 38-14 advantage. The Tigers went 30 yards in seven plays on their next drive, which ultimately ended with a 2-yard TD run by Ayden Barnes with 5:14 left in regulation. Gallia Academy claimed a 20-16 edge in first downs and both teams committed two turnovers apiece in the contest. The hosts were flagged five times for 50 yards, while IHS was penalized three times for 20 yards. 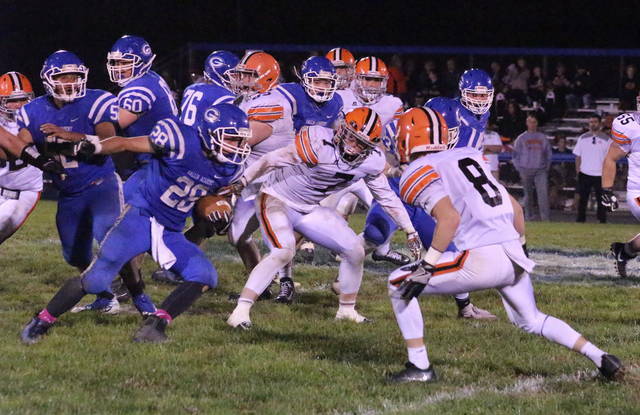 The Blue Devils churned out 385 rushing yards on 53 attempts for an average of 7.3 yards per carry, while the guests mustered only 166 yards on 55 tries for an average of three yards. Pullins led GAHS with 188 rushing yards on 29 attempts, followed by McClelland with 126 yards on 18 carries. McClelland was also 5-of-11 passing for 40 yards and completed passes to five different receivers. Trentin Waller recovered a fumble and Stout had an interception in the triumph. Pullins, Waller and Carter Campbell also recorded a sack apiece for the hosts. Salyers led IHS with 90 rushing yards on 25 carries and also went 7-of-19 passing for 121 yards, throwing one pick and one TD. Reid Carrico led the guests with five catches for 87 yards. Any first-year coach is looking for signs of progress this late in the season, and Penrod thought there were some real positives to come out of this game. The Blue Devils just doubled their win total from over the last two years and can finish the season .500 with a victory next Friday at South Point. “What we did tonight is what Ironton usually does to other teams. Ironton has always been that team that just pounds the ball down your throat,” Penrod said. “Tonight, we were the more physical football team and I really think we wore them down. We really had some luck taking it to them on the ground tonight.